Home / Applications / Types of Glass"
Glass is a very versatile material where it can be shaped and used in our everyday applications. Some of the most commonly used application that we see in our everyday lives includes when drinking beverages, to store food, for windows in our homes and even for automobiles. Besides the common applications, glass is also used in many unseen applications. For instance, glass components are used a lot in industries such as the medical field or in the science lab. Glassware includes the frequently used beakers, flasks, and stirrers, etc. Glass is a nebulous material that lacks a long range periodic crystalline structure. It can be formed through different methods. The most common method involves heating the raw materials into molten liquid glass. 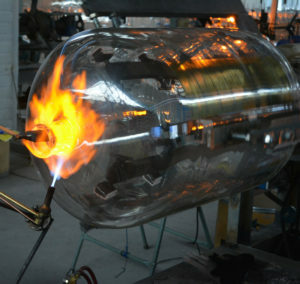 The molten liquid will then be shaped and rapidly cooled to form the desired shape. When melting or cooling to form the glass, the process often begins as a mixture of several critical raw material powders. These mixture can be composed of many different components, each with its important role. Most compositions would include network formers, fluxing agents, property modifiers, fining agents, and colorants. The chemical formulation would dictate the physical properties and characteristics of the formed glass which would form the different types such as borosilicate glass, soda-lime glass, etc. The raw materials are heated up to the sufficient melting point where it would turn into a viscous molten liquid. The materials can then be manipulated and shaped into the desired glass form. Glass can be manipulated and engineered to exhibit the different physical, chemical, and optical properties. Different applications would require specific types of glass and manufacturing processes. In commercial glass manufacturing, there are a few compositions that are normally used. In this article, 3 of the most common commercial glass compositions, their properties, and typical applications will be explained. Open your fridge and you will most likely find containers and jars made of soda-lime silica glass. The soda-lime composition is commonly used to create food and beverage containers, decorative items & accessories, windows & panes, and lab wares like beakers or cylinders. Soda-lime Silica glass accounts for nearly 90% of the glass manufactured in the world! Why so? Well it is relatively inexpensive to manufacture as the materials used is very common. The manufacturing processes have also been refined, optimized and automated over the years to improve the through-put for mass production of these glasses. However, soda-lime silica glasses are not as durable as other classes as they tend to be prone to thermal shock failure and can degrade in chemically corrosive environments. However, through additional manufacturing such as chemical and thermal strengthening, the durability and strength of the soda-lime glass can be improved. Developed by German glassmaker, Otto Scott. ­ The Borosilicate glass is most commonly used in the science industry, known for its superior durability, thermal shock resistance and can withstand extreme thermal cycling. In industrial or transportation environment, glasses are frequently exposed to harsh chemicals such as jet fuel, hydraulic fluids, acids, saline solutions, solvent, and bases. Even persistent exposure to water can cause damage to some glasses. Borosilicate glasses stands strong has shown an ability to resist both moisture and chemicals attack. Because of this, Borosilicate glass composition is most commonly used for laboratory glassware, sight glass within industrial equipment, explosion proof lighting, etc. Phosphate glasses are mainly composed of P2O5. This glass features a high resistance to hydrofluoric acid, but otherwise they have a low resistance to chemical corrosion. These glasses feature a high resistance to hydrofluoric acid, but otherwise they have a relatively low resistance to chemical corrosion. The phosphate glasses are well suited for doping with various colorants, including transition metal ions and rare earth oxides. These colored glasses is found to be useful in the various medical, military, and scientific applications.